Knit and Spin with Susan: Oceans of Fun! Southern California Handweavers' Guild "Weaving & Fiber Festival (WeFF)"
Alright, now where was I? Ah yes, vacation. So we headed off for our wee boat cruise to Catalina on Sunday morning after running around frantically trying to not forget anything. I have never realized how much crap it takes to manage Alex for a week. Yeesh! First stop, Two Harbors to stay the night and pick up the SIL in the morning and the niece, the nephew rode with us. Alex and I slept most of the way, we timed departure for just about naptime on purpose. 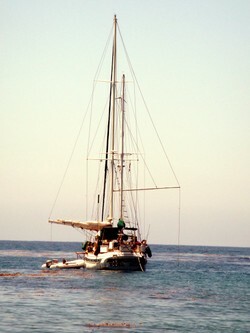 Our conveyance as usual was Teal Sea, the parents in law's CT 54" ketch. We did see a few dolphins on the way out. We made excellent time since there was no wind and we had to motor and decided to moor at Cat Harbor on the back side of the Ismuths. We went for a lovely evening walk to Two Harbors to get the requisite Ice Cream, as it is the only place I know where I can get Banana Nut Ice Cream. Alex and Andy (the nephew, they're all A's, Andy, almost two, Alex, 9 months and Abby, 3 months, we call them the A-List) had fun going down the slide at the playground, and Bella enjoyed a good run through the fields. The leash laws are sorta winked at there. Next morning the SIL Chelsea and Abby were picked up from the Catalina Express as she gets a wee bit (read: quite a bit) seasick. We departed for Little Harbor to spend the next few days. Only casualty was Andy got stung by a bee. First bee sting for a almost 2 year old and he did pretty well, considering. Tyson and Chelsea went for a dive and saw a couple of bat rays, tons of lobsters and an octopus. Much fun was had playing ashore the next day on the beach and such, until poor Andy managed to get stung by a bee AGAIN. Sigh. Luckily, he didn't turn out to be allergic, so there weren't any issues. Bella also decided to try and did a hole home to Hong Kong for Chelsea and Co. Thursday we moved on to Avalon, the city most people think of when they think of Catalina. We spent the day there wandering around, where I managed to make it into Catalina Crafters finally after trying for the last few times I have been there. 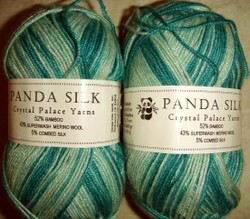 I picked up some lovely Crystal Palace yarn I've never seen, Panda Silk, which is 52% Bamboo, 43% Superwash Merino, and 5% Combed Silk. Super soft, a little thinner than usual sock yarn, bit I think it will still make a nice pair. We headed over to White's Cove that night, home of Camp Fox where I spent a week as a camper in Junior High. 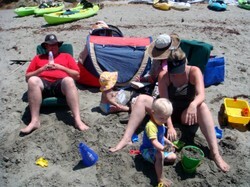 Friday morning, we put Alex down for her nap under the watchful eye of Grandma and headed out for a snorkel. Lots of Garibaldi, one tiny octopus that I didn't see and that was about it. 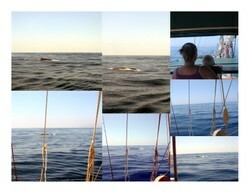 We headed home on Saturday, motoring again since there was no wind. We managed to get lucky enough to see what we think was a Blue Whale. Absolutely huge and just an honor to get to see. So amazing! 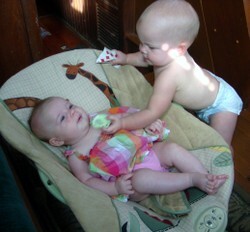 I did manage to get some knitting done and a little spindle spinning, but not much as we were busy keeping Andy from pushing Alex and taking her toys, Alex from bugging Andy and taking Abby's pacifier and keeping Abby happy in general. I didn't take the girl's blanket since it takes up too much room now. 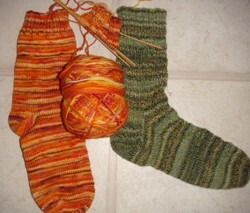 Both socks have been lingering on the needles for quite a while and really only had the toes to knit. I got the second orange one cast on, but I held off on the green since the ball hadn't been wound yet and I want to do that first. That folks, was my summer vacation in a nut shell. 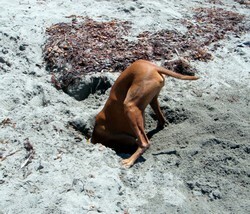 Now, as much as I love my little girl, I need one without her on a tropical island. Sigh. Any cheap suggestions? Like I can use airline miles?? Or a fairy godmother?? ?